The UMID-330 digital readout system a multiple function digital processing system used in optical grating measuring and video measuring. It is widely used on profile projectors, tool microscopes, CCD measuring machines, etc. Especially for the profile projector used, which will offer complete and powerful measuring function. Including building system and measuring through collecting points function. The accuracy of the linear scales sampling circuit counting up to 24 bits, counting frequency up to 1MHZ, when the resolution is 5um, the counting speed up to 5m/sec. Power anti-noise and signal anti-noise capability up to 2500V. Inputting power supply is AC 100V-240V. Smart design,dimension 287 x 196 x 83.4mm, weight 1.5kg. Point, line, circle, angle, distance, rectangle, threads, etc measuring, preset and constructing available, points collecting amount up to 50. Coordinates straighten and offset function included, saving the adjusting time. Linear compensation and section compensation for the linear scales. The Z axis is available for linear scales or encoders. 100 saving space for permanent image elements in the internal memory. Eliminating function, able to eliminate the list, coordinates offset or all. Authorizing function, users need password to access all the operation. Call out function, users can call out any permanent image element from the memory through the ID number. Compatible with foot switch or touch probes, easy and fast points collecting operation. Printing function, able to print the image elements or measuring result data. RS232 connection included, output the linear scales counting to the PC. 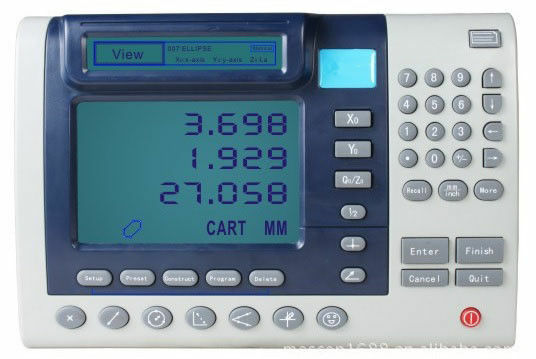 User programming function, users can record the measuring process for the part, and execute cycling. It is a powerful function when doing the mass production measuring. Multiple coordinates type, rectangular axes and polar coordinates switchable. Also inch and mm are available for the unit display.